Return from Melaka. 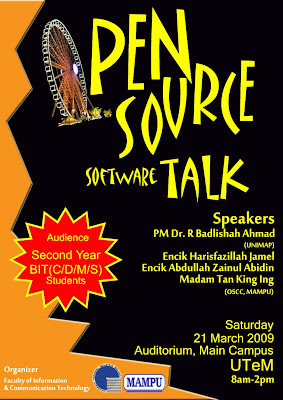 Give a talk about OSS in UTeM. This was a close function organize for year 2 students of “Sarjana Muda Sains Komputer”. Our thanks to Prof. Madya Dr. R. Badlishah Ahmad. Dekan, Pusat Pengajian Kejuruteraan Komputer & hubungan UniMAP came down far from Perlis to talk about “Advances on Embedded System & Application Development using Open Source / Free Software OSS/FS".